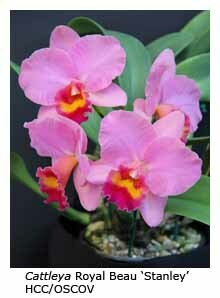 First, decide whether your orchid is a species or a hybrid. In the case of a species orchid (provided that the name tag has been recorded correctly) the first term (the genus) will begin with a capital letter, while the second term (the species epithet) will not. Laelia anceps is an example. In the case of a hybrid, all terms will begin with capital letters, e.g. Cymbidium Narela or Cymbidium Leopard Lady. 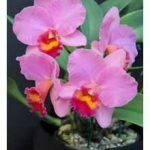 Having determined (from its name tag, or by asking an experienced grower) that your orchid is a species, there are usually three classes in which it may be exhibited – Australian Native Species, Paphiopedilum Species or Any Other Species. It will be obvious from the label if your plant is a paphiopedilum species but you may need to seek advice from a more experienced grower as to whether your species is an Australian native or not. All other classes are for hybrids, whether the class labels specify that fact or not! Only the class for Australian Native Hybrids actually specifies that the class is for hybrids only. 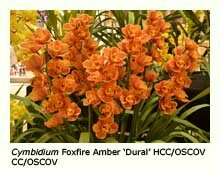 However the class Standard Cymbidium really means Standard Cymbidium Hybrid, the class Dendrobium means Dendrobium Hybrid, and so on. 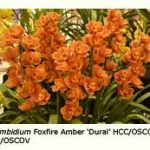 A surprising number of exhibitors, some quite experienced, still make the mistake of entering their dendrobium species in the Dendrobium class, forgetting that it’s for dendrobium hybrids only. 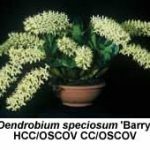 Dendrobium species, like all species other than Australian natives and paphiopedilum species, should be entered in the Any Other Species class. The various Classes used in the show-bench competition at North-East Melbourne orchid Society meetings are shown below. Sometimes the judges create additional classes in the event that there are a substantial number of entries in a particular class. 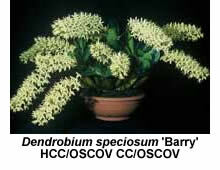 For example, they might sub-divide the Australian Native Hybrid class into Dendrobium hybrids and Sarcochilus hybrids, provided that there at least three exhibits of good quality in each. If there are sufficient entries, the judges may sub-divide the Any Other Species class further into Species: Asian, Species: American and Species: Other. By all means fill in your entry card with the country of origin of your species exhibit but if you’re not sure, just leave it up to the judges.